One day we came across a massive amphitheater cave thing. Heath said he wanted to reenact some concert by a band called Pink Floyd (?) at Pompeii in 1972. It turns out the acoustics just weren’t that good. Whatever, the music sounded kinda depressing anyway. On another day we pulled the boat off the river and hiked up the incline to where it meets the sheer cliffs of the canyon. There we found some American Indian ruins that used to hold grains for storage. Very cool view. This morning when we were packing up the boats, John dropped the lid to one of our dutch ovens in the water. I said forget about it after he gave it a good shot at trying to find it with his feet, but he wouldn’t let it go until he found it. Well, he found it. He’s so darn persistent. 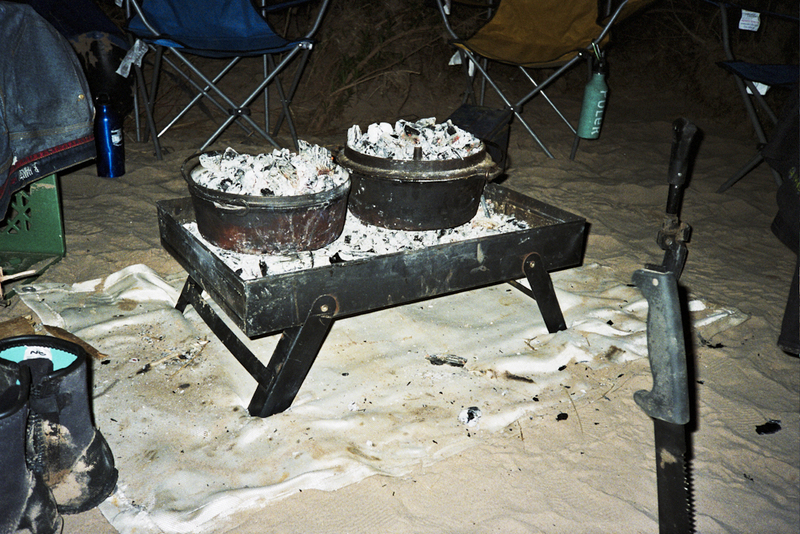 Speaking of dutch ovens, they are these great pot things that you can bake in when you have a fire. All of us assumed Ben didn’t know how to cook because in the morning he just shakes handfuls of cereal in his mouth followed by a swig of milk instead of making a real breakfast. Well, we were wrong. Once we told him it was his night to cook , he whipped up some amazing pizza right in the dutch ovens. Who knew? Check out Heath’s postcard. Pretty cool huh? We dropped it off at a place called Phantom Ranch. It’s one of only two places in the US where the mail is still delivered by mule. Bye, tell Mom I miss her. DUDE, Dutch oven pizza is ssuperfantastic. My dad always made it on camping trips. The scenery is ridiculously awesome as well. Great stuff…keep it coming! PS: I sure hope Heath’s dad hangs that postcard on the fridge for eternity. God, I love the scenery. So amazing…. It’s great following your journey. Good thing you’ve got a trained EMT/Lifeguard with you!! Have fun and be careful! Camp life, not so bad, dude. You guys rule.